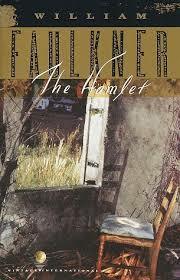 The Hamlet is the first book of what is known as The Snopes Trilogy. Faulkner seems to be setting up some characters and background as well as the history of the Snopes family which is explored in the next two novels. I plan to read these later this summer – (one book a month) – I’ve wanted to read them since I was about 18 or 19. The narrative of this volume consists of a collection of interrelated stories in various lengths concerning some of the people in the fictional Yoknapatawpha County, specifically the tiny town of Frenchman’s Bend. The events described mostly occurred in the early 20th century. Some of them are more “Faulknerian” than others. This might be a good novel for a newcomer’s approach Faulkner, but there are other approachable novels and stories. I’d recommend “The Bear,” a powerful novella. Many of the works in The Hamlet are humorous or have humorous aspects, but others are pretty grim. It seems Faulkner did try to give most of them a cheerier ending. Several of the stories are about trickster type trading and homicides. Quite a lot of this conniving makes the less than ethical Flem Snopes rich. A guy named Ratliff wanders through many of the stories collecting and distributing gossip along with his sewing machines and other goods for trade. He’s a story-teller for the reader. The major characters, entering into many of the stories, are Flem Snopes – white trash getting ahead and Will Varner – old money deteriorating.